Member for Northern Tablelands Adam Marshall at Glen Innes TAFE Campus, where a new Connected Learning Centre will be constructed. FUTURE-FOCUSED training is a step closer for the region, with Member for Northern Tablelands Adam Marshall and Assistant Minister for Skills today announcing the start of construction of a $2 million industry-leading TAFE NSW Connected Learning Centre in Glen Innes. Work is also starting today on Connected Learning Centres (CLCs) in Tenterfield, Coonabarabran and Quirindi. Mr Marshall said the major project would deliver on the NSW Government’s plan, unveiled late last year, to significantly enhance TAFE NSW’s presence across rural and regional NSW and enhance or replace outdated facilities with the new digitally enabled CLCs. “I am very excited to announce the start of work at Glen Innes as the government continues to enable TAFE NSW to grow as a world-class, innovative and flexible public provider that is delivering the new technologies and skills to support our local economies,” Mr Marshall said. “When completed, the Glen Innes CLC will be a multi-purpose and digital learning facility where students will receive more personalised learning experiences, better access to teachers both on and off-site, simulated work environments and directly relevant training for skills shortages of the future. “In addition to providing local students with access to a greater range of learning and course options, the CLC will meet a variety of local needs and remain at the heart of the community on the existing TAFE campus. 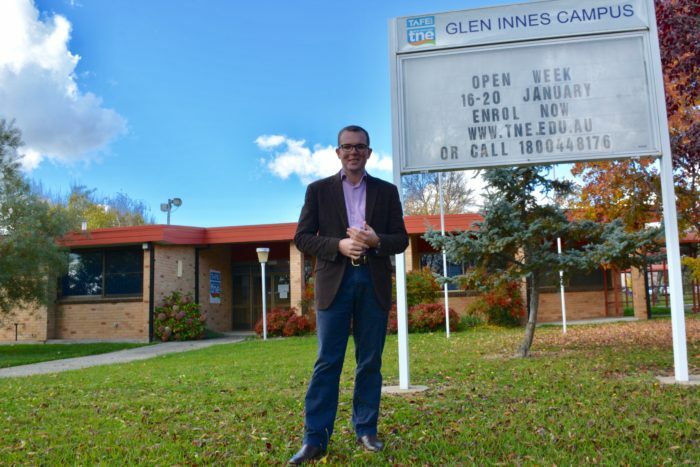 “Currently, many Glen Innes students are forced to travel to Armidale or Tamworth to undertake all or significant parts of their courses – the construction of the CLC will negate most of that travel, allowing students to study many more courses in Glen Innes. “I am delighted with this strong focus, backed by a $2 million investment, in the Glen Innes community, where TAFE’s existing facilities would not be able to meet future skills needs in our district’s growing and increasingly diverse economy. Construction of the Glen Innes CLC will start immediately, weather permitting, and comes in addition to the nine new TAFE NSW SkillsPoints announced earlier this year. To take a CLC digital tour, visit www.tafensw.edu.au/about-tafensw/one-tafe-nsw and click on ‘Take a virtual tour’.